You are here: Home / SDI Blog / What’s the Big Deal with Lionfish Being Invasive? Many people know that Caribbean and Atlantic lionfish are invasive. Few, however, really understand why their presence is a big deal. Lionfish are naturally part of the Indo-Pacific and Middle East ecosystems. Their natural role in these parts of the world is to be what is called a secondary consumer. If you look at the picture of a basic food chain, lionfish are supposed to be where the Ocean Sunfish is. However, over the past 20 years, lionfish have stolen a spot on the top of the chain. This is where sharks are in the Atlantic Ocean without the natural population controls. This has led them to break the natural ecosystem of the Atlantic Ocean and Caribbean Sea. If you think about a typical top oceanic predator, you probably think of a large shark or a killer whale. 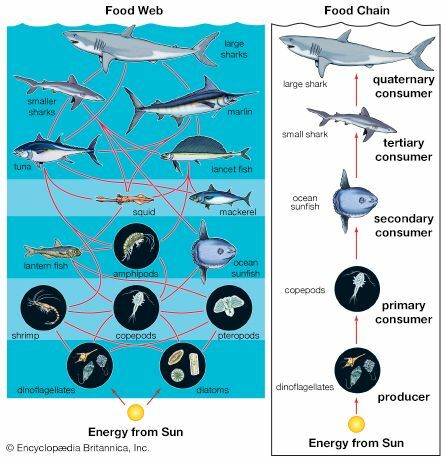 Again, we can use the diagram of an ocean food web for a guide. If you’re at the top of the food chain, how is your population controlled if no one is hunting you down? The first is reproduction rate. Large sharks such as the Sand Tiger (Carcharius Taurus) have only two pups at a time. This happens every two to three years. It means they reproduce by about one pup per year. The second thing that controls the population of top predators is how long it takes to become sexually mature. A new Sand Tiger pup won’t be able to reproduce until they are about ten years old. These two things help keep the populations of natural members at the top of food chains under control. We can also use ourselves as an example of a top predator. If we remove all our fancy technology and medicine, and return to our natural way of life, we are no better off than sharks. Most women only have one baby at a time and can do so only every two years or so. Humans also aren’t sexually mature until about 12 (even though culturally, we wait even longer). Without those types of controls on our population our numbers can grow untamed (with all our modern medicine and technology, some argue that we are becoming that way now). In contrast, lionfish can lay up to one million eggs per year. They become sexually mature in only 2 years of life. In the Indian Ocean and Pacific, lionfish are naturally a middle-predator. This means normally they would have predators acting as population control. In the Caribbean and Atlantic, where they have invaded, lionfish have no natural predators. This has allowed the lionfish population to grow without limits. This means lionfish have forced their way to the top of the food chain. This untamed population has led to what we know to be the problem: Degradation of the Caribbean and Atlantic coral reef ecosystems. Lionfish are not picky eaters. They will eat anything. Mostly, they eat the grazers. These are the fish and shrimp that eat algae. This results in algae growing on top of all the pretty corals. Turning colorful reef landscapes into murky green wastelands. Look at the before-and-after photos of the same reef. Lionfish aren’t solely responsible for the decline, but they do play a big part in it. Current efforts to control the lionfish invasion are led by sport divers, like us using pole spears. Most of the affected coastlines don’t have fishing license requirements for lionfish. This means sport divers can kill them without any restrictions. Lionfish tournaments can wipe out thousands of lionfish in a single weekend. Scuba diver with a loaded pole spear aimed at a lionfish. Photo by Shawn Harper of the North Carolina Aquarium on Roanoke Island. Beyond scuba diving, lionfish are common bycatch for many lobster fishermen. This is because lionfish and lobsters prefer similar habitats. There is also a lot of research being done by NOAA and other academic institutions to find new insights into lionfish ecology. There are innovations such as traps and Remotely Operated Vehicles (ROVs) being developed to make lionfish hunting more efficient. So, what else can we do to make a dent in this invasion? EAT THEM! If you’re diving in the Atlantic, go ahead a take a spear with you. Kill any lionfish you find. If they are big enough, eat them. When you make a good haul, have a barbecue and share your catch with neighbors. Lionfish are delicious, and safe to eat because the flesh is not venomous. If we can get more people to develop a taste for lionfish, we can get them on coastal menus. We have seen what happens when humans develop a taste for tuna, groupers and the like. When humans like to eat something, we can eat them into endangerment. Now we have something we can eat guilt-free. 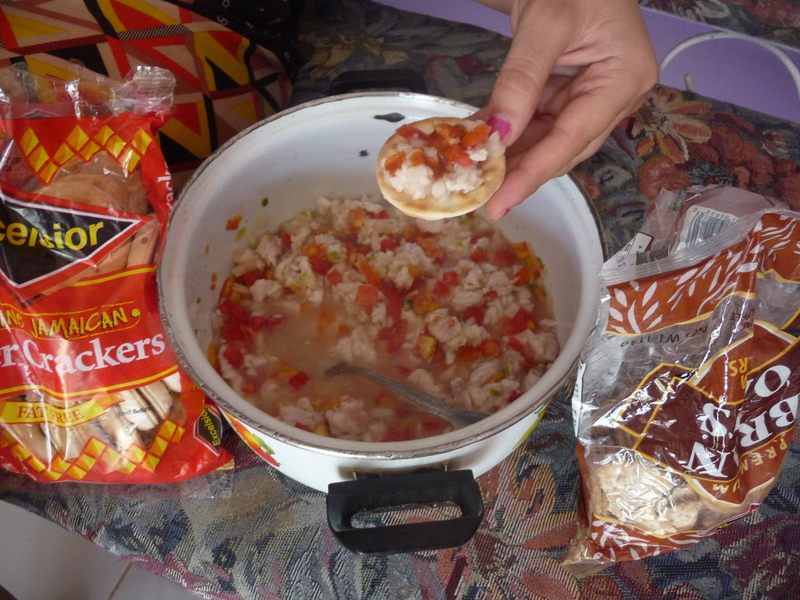 Lionfish ceviche is one of the favorite lionfish dishes. As divers, we love the ocean. For most of us, that was our motivation for becoming divers in the first place. It is fitting for us to advocate taking care of the ocean we love to explore. Many divers who have traveled to the eastern United States have heard that, “Lionfish are invasive and destroying the reef.” What they may not understand is exactly how lionfish degrade the reefs and how they became so successful. This can lead less-informed divers to think, “So what? There’s a new species. Who cares?” It falls to the rest of us to educate the uninformed. I hope this gives you a better glimpse at how lionfish are so successful and how they are degrading reefs. As a Floridian People ask how the lionfish invaded so affectively the Gulf and Atlantic. Well FWC says we generally did it by letting them be released either by hurricanes that destroyed homes like Andrew and by people letting them go because they didn’t understand that the lionfish eats everything in their saltwater tank. We might be able to get them under control if every sport diver would kill every lionfish they see at the dive sight, since you don’t need a Florida saltwater fishing license to take them and the fact they are a great fish to eat it just might work. It is believed that the initial onset was due to hobbyists releasing them, either intentionally, or from Andrew and the like. That is how they got here, but not how they became so successful. Similar things are true with the iguanas in South Florida, and the Burmese pythons. They are middle-level consumers who have commandeered a spot at the top of the food chain. It is important to note that “How they got here” and “How they were so effective with their invasion” are two different questions. The FWC quote you described answers the “How did they get here” and the release from hobby aquarists with some help from Andrew as you mentioned, is widely accepted by scientists to be the onset. However, “How they were so effective” is what I aimed to at least partially answer here. We dove Bonaire at the end of April. Bonaire has Lionfish removal program that is mostly done through diver masters and divers fishing them out. I believe that their program is working. We did 14 dives the week we we there and I only saw 4 Lionfish that whole period. To top that off, Lionfish is on the menu everywhere along with street vendor that have it too. The best long term hope is the development of local predators. Groupers and large snappers have been observed in a few places eating lionfish. There have also been some die offs for some disease reason maybe a local bug they were not immune to. So shooting and eating in the short term while nature finds a long term solution. Excellent info; concise. What keeps lionfish in check in the Pacific? By the way, I was diving around Komodo in June (11 days), and only saw a few lionfish. The short answer is predators in the pacific. One established predator is the cornetfish for the juvenile lionfish. Unfortunately, cornetfish Atlantic relatives such as the trumpetfish have not taken that role. There is also some evidence of some echinoderms that help keep them in check in the pacific. There is some evidence of eels, sharks, and large groupers predating on lionfish. The issue is the groupers don’t get big enough before they are speared themselves. Many of the candidates for lionfish predators have been overfished in the Atlantic. I just came back from Curacao. The lionfish there are as plentiful and large as I have seen anywhere in the last few years. Some so big I cannot keep them on my spear if I don’t trap them against something. We dove Coz last December and in 13 dives, I saw 4 lionfish. I know they have started to sell them in restaurants now so maybe they are starting to make a dent in the population. I know for a fact one issue that hampers the cause is the notion that we are killing just to be killing. We have been on a dive boat and was told if there were other divers other than our group, they would not let us shoot them as it upset the other divers. Many divers are uneducated about the lionfish and don’t understand how destructive it is to the ocean ecosystem. Thank you for providing an excellent description of the problem and some possible solutions to the problem of invasive lionfish. Also how about a few videos on how to prepare for cooking? That’s a great idea! Do you have any recipes? The REEF organization has published a whole cookbook with 20 or so recipe’s. Using a before-after photo of a degraded reef in the Pacific takes away from the credibility, Jordan. While the relationship and impact to reefs is there, you are making a big jump to suggest Lionfish have been responsible for the reef degradation in the Caribbean. There are many well-published reasons for the decline prior to the introduction and proliferation of the Lionfish. This is not to say that the reef inhabitants, and thereby the reefs themselves are not being impacted, but please stick to the facts.